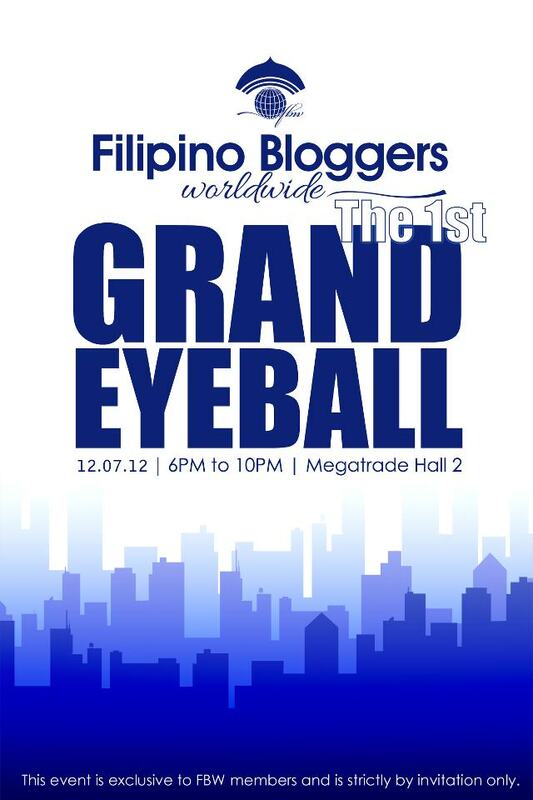 The members of the blogging family of Filipino Bloggers Worldwide (FBW) are finally coming together for the first Grand Eyeball on December 7, 2012. This will be quite unique since most of the "family members" will be seeing each other for the first time after getting to know each through our blogs. To make the most of the event, attending bloggers will get to be part of a free seminar intended to benefit all of us and of course get to socialize with friends we have met online. 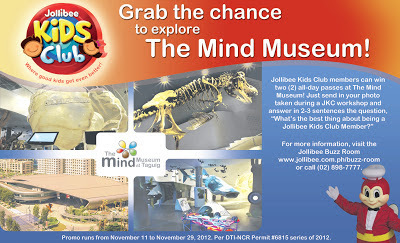 So come, join us in this momentous event, and be a proud Filipino blogger worldwide! 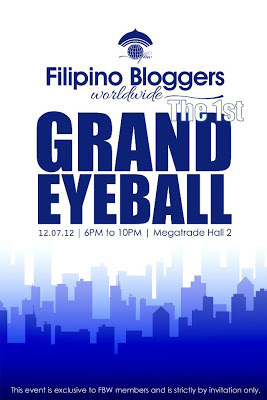 Filipino Bloggers Worldwide: The 1st Grand Eyeball is brought to you by Filipino Bloggers Worldwide, Ex-Link Events, Bo’s Coffee, ShareTea Philippines, B’s Cupcakes, Water For Less Purifying System, Breakfast Magazine, Azta Urban Salon, Ystilo Salon, Beauty by Ria, Bagellia Filipinas, Tough Brat Bags, VESTI, Always 10 List, Frank & Carol’s, Pinky Toes PH, Jana Kathryn, Kikay Konek, Astigirl by Tweet Sering, Blogger Manila, Gadget Gambit, Towercamp Phils., Inc., Say It Nessie, Budget Biyahera, The Purple Doll, Shopping with Juan, and Smart Mommy Online. As we go about our lives, we come across people who become family not in the biological sense but as a part of our personal hopes and aspirations. Like-minded people sharing a common interest such as blogging in this case, have that natural capability to understand the other and hopefully be a positive influence towards achievement of respective goals. There is strength in giving and sharing. That said, let the FBW 1st Grand Eyeball be the start of many more unifying events for the FBW family. Christmas Aguinaldo for Children - the Box or the Envelope? In the Philippines, the Christmas aguinaldo or gift for children either comes in a box or an envelope. A boxed gift represents items that can be used by the child such as toys, clothes, or gadgets. An enveloped gift represents money which can be used by the child to buy an item or items of his or her own choosing. In this age and time, in what form should we give gifts to our children? The aguinaldo is an inherited tradition from our Spanish colonizers. However, the practice of aguinaldo giving does not only happen in the Philippines. Countries like Puerto Rico, Venezuela, and Trinidad and Tobago also have this although not exactly the same as Filipinos are accustomed to. These three countries' idea of aguinaldo are more in line with each other because they all connect aguinaldo to a musical gift. It is supposed to be a Christmas musical genre that commemorates Jesus and the joy of Christmas. In the Philippines, the closest relation to music of aguinaldo is the caroling done by children with the expectation of getting cash or coins. It isn't quite clear why the aguinaldo came to refer to the "money gift" . Today, aguinaldo can refer to a boxed gift or money gift typically placed inside a regular envelope or traditional Chinese red envelope. The latter is a borrowed tradition from the Chinese where red envelopes that contain money are given by grandparents and parents to the younger generation during New Year. The traditions of Christmas are observed primarily for the benefit of children especially during these economically difficult times. Parents will try to find ways so that children will get to enjoy the Season like children should, Being young, the children's concept of the spirit of Christmas is still limited and is usually confined to material benefits which come in the form of gifts from parent, grandparents, and the notoriously hiding godparents. There was a time that gifts for children were mostly toys and clothes. then came the gadgets. Giving money as gifts for children has always been there somewhere. It just became more prevalent lately since more and more people are seeing the practicality of allowing children to choose what they want by just giving money. This gives rise to the question of which is the better gift option to give to children. When it comes to gift-giving, I am a hold-over of the traditional type. I prefer to buy gifts which I think a child would like and am not inclined to give money because the amount provides an automatic price tag to it. Besides, I think that gift-giving is something personal especially when it involves people that matter to me. That said, I am really interested to know how others think about this issue. So please take time to comment what you think. For the Christmas aguinaldo for children, would it be the box or the envelope? 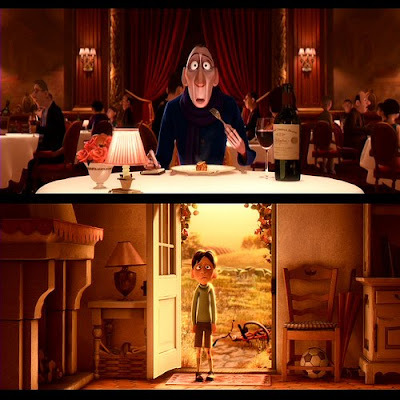 Vote on the upper right hand corner of this page. Thank you. Two men related by birth for sharing the same parents are brothers by blood. Although there are the so-called blood brothers who are not at all biologically related but enter into a compact of treating each other as such, biological brothers are still different. Like true-blue sisters, they share a common history that can be strengthened by time. Based on personal observation, an older brother can be the defender, the idol, the bully, or the privileged one. Depending on how an older boy is raised and treated by parents and siblings, an older brother can be the best or worst thing that could happen to a younger sibling. This is very critical since a growing child usually takes a cue from the people surrounding him. When he acts as the defender , he is seen as a lifesaver especially in situations wherein a younger sibling is finding some difficulty in. He is an idol when he is popular and brings honor to the family in terms of awards and other forms of recognition. He is a bully when he uses his superior strength to get his way over his younger siblings. He is the privileged one when his parents give him special attention for being the eldest son to the detriment of the younger ones. The younger brother can be the protected, the fan, the bullied, and yes, also the privileged one. He is also often seen as a nuisance, especially by an older brother who wishes to set himself apart from childish meddling. He usually demands to have his way by virtue of being the younger one which an older sibling should give way to especially in situations where the one who whines the loudest wins. A younger brother usually looks up to an older one and may seek protection and guidance from him. He can be the faithful minion of his superhero older brother. He can also be an important ally when big brother gets into trouble. Fortunately, most of the issues between brothers in their childhood days are settled as they grow older. In adulthood where physical superiority usually no longer exists, the rank in age is what is left to dictate the rules of engagement between brothers. Even with the existence of competition during their younger days, brothers eventually learn to adjust and can actually end up as good friends. Brotherhood by blood cannot be denied even with conflicts and disagreements. The special bond between brothers is an important factor in the healthy development of their characters. Brothers are the greatest source of "manly" support especially when the father is no longer living. When two men are brothers by blood, it connotes a deep relationship that is not usually broken by shallow reasons. Brotherhood, even among those who are not biologically related, means standing side by side in support of the other especially in terms of adversity. It speaks of a unity that is solid and founded on love and respect. That said, parents usually hold the key to how sibling relationships turn out. It is to the best interest of the family to encourage support between sisters and brothers by blood. The Jollibee 18th Maaga ang Pasko kick-off at SM City Calamba signaled the start of the longest running toy and book donation drive for the year 2012. Founded by actor Aga Muhlach and formally launched by Jollibee in 1994, "MaAga ang Pasko" continues to be one of the most awaited yearly events particularly in the holiday season. Today, the event made a stop-over in Southern Luzon to bring cheers and hope to children who are not particularly expecting a "merry" Christmas. For the most part of its existence in the Philippines, the Maaga ang Pasko traditionally made its kick-off in Metro Manila alone. Starting last year however, as the program expanded its purpose and coverage, the event has seen action as well in several provincial areas. This year, the Laguna area is one of such places that have been pinpointed for this year's celebration. The other events are expected to happen or have happened in Metro Manila, Bacolod, Tarlac, and General Santos. From its small beginnings as a personal initiative to give gifts to children during the Christmas season, Maaga ang Pasko has transformed into a program that involves Filipino families sharing their blessings to the less fortunate. By being one of the Jolly Family Toy Scouts, families as well as partner schools and companies in the region will find a way to be a positive part of the lives of children in need. Mall-goers had their chance to be part of the event by presenting new or old toys or books exchanged for tickets to join. The event featured fun games, family themed booths, and a special magic show. Prior to the formal consumer launch in SM City Calamba, volunteers known as the Jolly Toy Scouts took their oath to support the program. The partners were introduced by host, Bettina Carlos and were asked about their respective pledges in support of the program. Each partner hung ornaments on the Christmas tree to signify their commitment. The focal point however was the Jolly Toy Scouts Oath-taking which was headed by Ms. Bambi Bejo, Jollibee's Regional Business Unit Head for South Luzon. No event will be complete without some entertainment. Kapuso star, Crystal Reyes and Protege Grand Winner, Krizza Neri gave a couple of song numbers each to the delight of the audience. As the choir formally ended the event with the singing of the Maaga ang Pasko theme, everyone was again enjoined to support the program. It is hoped that Maaga ang Pasko donation boxes such as the one shown above and placed in designated areas all over the country will overflow once again not only with books and toys but also with genuine love and concern for others. The true essence of giving is said to be measured by how much it hurts the giver. We are said to be truly giving if the act gives us a pinch. 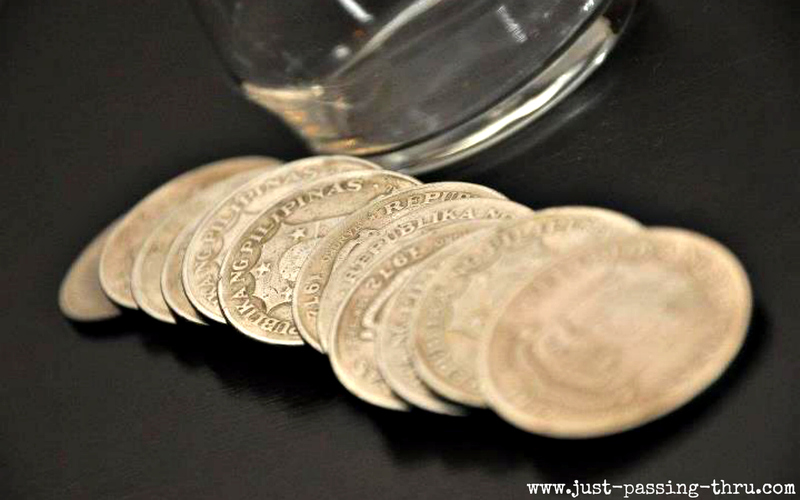 Thus a one peso donation from a needy person can be comparable to a million peso donation from an affluent person. That said, the Maaga ang Pasko program does not require us to give to the point of hurting. It simply encourages us to give away our surplus or things that we no longer use but can still be useful to others. Whether used or new, the things we give will go a long way towards seeing the twinkle of hope in the eyes of needy children. The nobility of its purpose is probably the reason why Maaga ang Pasko book and toy donation drive has managed to reach its 18th year. Competition between siblings almost always have a negative connotation. Visions of fights, spats, and strategical movements to come out ahead easily come to mind. However, there is such a thing as friendly competition between siblings that does not seek to pull down each other but rather seek to bring out the best in each. My children's school holds their yearly intramural and cheering competition by dividing grade school students into three groups comprised of the red, the blue, and the yellow teams. Every team will be made up of students from the the grade 1 level up to the grade six level to ensure a more or less balanced composition in strength and capabilities. For the second year in a row since my two children found themselves together in the grade school department, my son belonged to the red team while my daughter belonged to the blue team. Since they belong to two different teams, it can be quite confusing hearing them practice their cheers at home. Each one would try to be louder than the other with my daughter trying to outdo her Kuya with her choreography. My son would usually just continue with his more subdued movements and would laughingly allow my daughter to prevail. On competition day, they will be dressed as opponents as signified by their colors. They will go to school ready to fight it out as best as they can to contribute to their respective groups. For an hour or so while performing, they will cease to be siblings but just be part of a group which they represent. Once the winners are announced and the identifying colors stripped from their wrists, they become siblings once again, accepting defeat gracefully and cheering for the victory of the other. They have given their best and fought well and they are as good friends as ever. I like observing my children when they are pitted against each other in a friendly competition. The situation I see them in gives me a clue as to what could possibly happen in real life. My youngest daughter is still understandably a little self-centered, demanding at times to be given favor because she is the youngest which my son would usually accede to. My daughter has her shining moments though when she acts like a mother to her brother by fixing his things, his clothes, and his projects given her ability in crafts. That said, I am praying that they will be able to develop a stronger relationship as they grow older. I am hoping that their different views in the future would not destroy their sibling relationship. I am looking forward to more opportunities for them to unite in spite of differences for I know there will be many such occurrences in their adult life. So let the friendly competition between siblings begin! 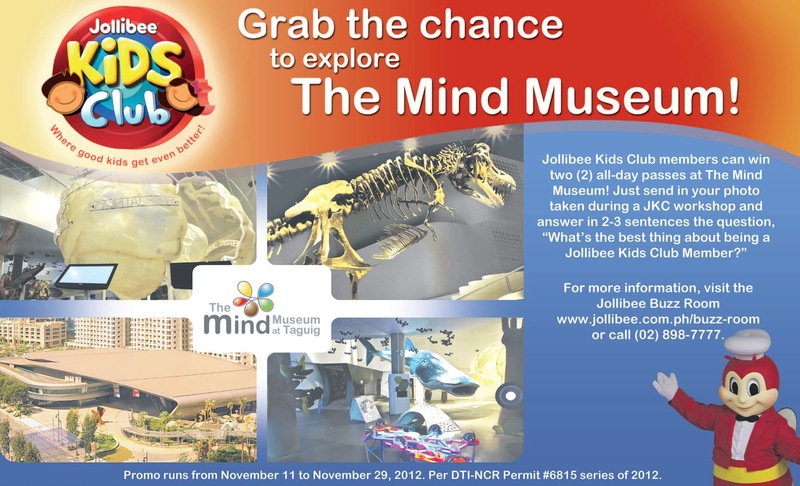 What would it take to develop a Pinoy Batang Pera-Henyo or a Filipino child finance whiz? Can children develop sound financial habits and ideas on their own? It is possible for a child to have his or her own investment portfolio in such a tender age? Available statistics with regards to the savings behavior of Filipino families are quite worrisome. The gathered numbers indicate that there exists a disproportionate rate of savings in relation to income. What is more disturbing is that the amount of savings becomes lesser as the income goes higher. This would therefore make the common notion that the reason why Filipinos are unable to save due to lack of income quite irrelevant. It would appear that the main problem lies in giving lesser importance to the value of savings. Another critical data in relation to this is that which presents a picture of Filipino families cutting back on important items such as education rather than on other expenses which can be seen as "luxuries". Adults who do not have the necessary financial discipline often find themselves in a financial bind. Studies reveal that it is difficult to instill behavioral changes among adults specifically in the financial aspect although it can be done. That is why there is a greater need for training children to start early on savings. Young people are generally more malleable and are able to absorb ideas and practices more readily than adults who have already established ways. The problem with this scenario specifically in the home environment is that it will be adults who will be doing most of the teaching to the children. If the adults in a household have no idea about financial soundness, how can they can be expected to teach their children? Parents are in an ideal situation where they can lead or influence their children towards good ways. Before they can effectively lead or influence however, they must know in which direction they are taking these young minds. With these concerns in mind, School Talk has organized a conference called the "Batang Pera-Henyo Conference 2012" which is slated to happen on November 17, 2012 from 9 am to 6 pm at the Vista Center in Worldwide Corporate Center. School Talk has been focusing on the education of the children and the youth primarily through learning events such as this and their interactive website. The events also seeks to involve the active participation of parents and educators in the common goal of creating the best learning experience for a child. This event enlisted the participation of 200 people composed of parents, educators, and children aged from 13 to 21. They are expected to participate in this one-day event which will tackle concerns in personal finance and money management. This event hopes to start what could be a continuous means of parents helping their children in money matters without actually having to bear the burden of giving money the rest of their lives. Home schoolers and youth organizations are encouraged to attend this event as well. Several speakers will be handling the topics scheduled for the day that includes Good Money Management and Financial Planning for Parents and Kids, among others. It is impossible to produce financial wizards overnight whether they be adults or children. It would need constant practice to really inculcate the values and behavior required for financial success. However, the starting point is always the most critical. That said, people who are willing to make a change towards financial success are not always equipped with the right mindset and knowledge of effective processes that can help them achieve their goals. I intend to start my own journey towards this path hopefully with my family by attending the Batang Pera-Henyo Conference. We all can benefit from a push towards positive results. For my children I will face a bout. Parenthood is defined as a state of being a father or a mother to a child or children. The scientific definition is quite cold as it refers to a parent as any organism that produces another or is simply a source or origin of the offspring. In the human context and in some animal species, parenthood is much more than giving birth to a child in the case of the mother or providing the means to complete the process of procreation in the case of the father. Parenthood carries the responsibility of raising and nurturing a child. It includes providing for the physical, emotional, material, and all other needs that will help a child develop into a responsible human being who is expected to continue the cycle to his or her own children. It also includes involvement in the many idiosyncrasies of growing up and a child's path to self-discovery. Most people think that they know what they are getting themselves into when they decide to get married and have children. They have certain standards and rules set for all the members of the family to follow. They find out soon enough that there is not such thing as hard-fast rules in raising children. The journey of parenthood is marked by adjustments, compromises, and giving. Parents will have theories of how they should bring up their children and then there is reality. All theories are usually based on an ideal setting wherein everything happens as planned. Since a family is composed of human beings each having their own will and thinking, it would be a miracle if a family proceeds through life without any hitch. Parents will have to eliminate the thinking that they can control the children. Control is only possible up to that time when children need it such as in very early childhood. Once the children can think on their own, parents would have to be ready to adopt to the situation. Acceptance of the very essence of the parental role makes it a lot easier for parents to understand how they should approach parenting. Children will have to be provided with their physical and material needs and parents have to work to be able to do this. Children will need emotional support and parents need to be present in their children's life to give this. Children will need to do some growing up on their own and parents need to step back a little to allow this. Parenthood has humbled me a lot. As I learn more about my responsibility of guiding my children as they grow up, the more I understand that extraordinary opportunity I have been given of helping mold a human being not by force nor by authority but by love and dignity. That said, parents will do well to dream, hope, and persevere while facing with strength and wisdom the realities of parenthood.